Pythagoras was born on 3 SEP 1799 in Briston, Addison County, Vermont, the son of unknown parents. He died in 1851 in Benton County, Arkansas. His wife is not known. They were married, but the date and place have not been found. They had no known children. I was asked to write this bit of history to expand on the families buried in the Woods Cemetery. The first name that caught my eye in our very first meeting was the Sprague family. I guess the name itself was so different from others on the cemetery list and I was drawn to it. In the process, I Googled the name Sprague and found that there was an extensive list of research into the Sprague line. their children moved to Missouri and then on to Kansas where Leah died in 1881 in Uniontown. Interestingly, the Reverend's father, Abraham, celebrated a bit of history himself. He was born in Providence Co., Rhode Island in 1764. As a very young man, he served in the Revolutionary War and participated in the Alarm at Providence on July 23, 1778. He died in March 1847 in Decatur, Macon County, Illinois. We pride ourselves in being able to travel here and there by automobile, plane and train in this day and time, but let us look back at how this man, wife and family moved here and there and then ended up in the Woods Cemetery in Little Flock, Benton County, Arkansas. It would be interesting if we knew the mode of travel and the time it took to move 9 children, a wife and belongings from Pino, IL to Northwest Arkansas. Son of Rev. Goras (Pythagoras) Sprague (1799-1851),who died in Benton co, AR, & Leah Smith Sprague (1806-1881), who died Uniontown, Bourbon Co, KS. Shelby moved at age 9 to Benton Co, AR in 1842 with parents & siblings and moved to Kansas circa 1859. He was survived by his mother & siblings: Alfred D., Dr. Guilford F, Oliver R, Columbus, Delila Sprague Reynolds, Perry, and John Condon Sprague. He was preceded in death by his father and by siblings: Riley, Jane, Sabra and Wilbur. Delila Sprague was born in Aug 1844 in Benton Co, AR, the daughter of Rev. Goras P.(Pythagorus) Sprague (1799-1851; he died in Bentonville, AR) and Leah Smith Sprague (1806-1881; she died in Bourbon Co, KS. Delila & mother & siblings moved from Benton Co, AR circa 1855 to Douglas Co, KS. 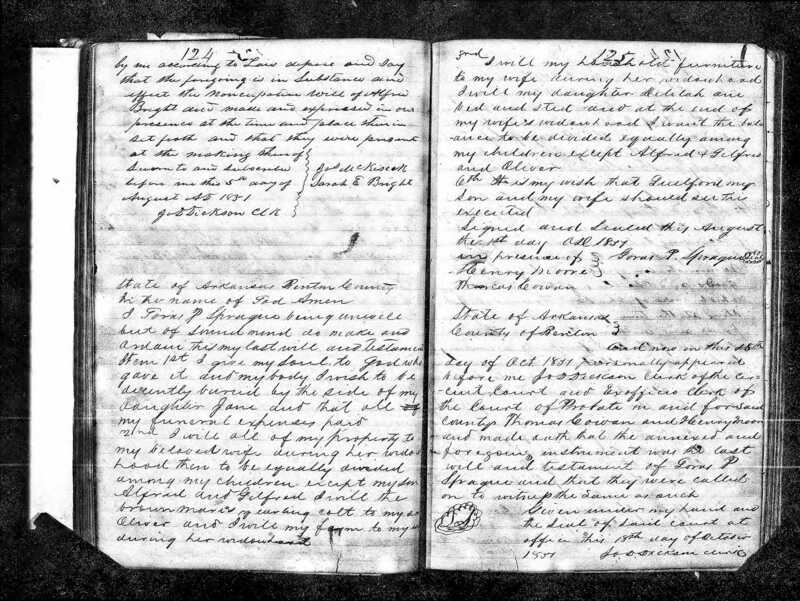 Delila married John Reynolds on 09 Nov 1862 in Centroplis, KS. They had a son, Charles Reynolds, born circa 1864 in KS. She died in 1865 in Douglas Co, KS. Her brother, Sgt. Shelby Sprague, is also buried in same cemetery.